As the summer winds down and you’re getting your Minneapolis MN area home ready for fall and winter, sprucing up your landscape seems the perfect way to spend your time. In the previous post we began our discussion of spruce-up jobs by focusing on do-it-yourself kinds of projects. In the second half of this post, we’ll deal mainly with jobs that tend to require a landscape professional of some sort. First you’ll need to determine exactly what it is you need help with. If your main concern is just the health of your lawn, you probably don’t need a landscaping contractor. And if your desire is to have someone keep your garden looking good, a professional gardener could be the right choice. Some landscaping firms provide a wide range of services, while others are more specialty contractors, so here is a list of services with an eye toward matching each job with the right contractor. Lawn service: Those who work in the realm of lawn service are generally involved in mowing and trimming as well as administering fertilizer and week killer. Gardener: A gardener simply performs routine chores related to a garden – weeding, dead-heading, transplanting, thinning, etc. Landscaper (also called a landscape gardener): A landscaper works with adorning the existing property by planting such things as flowers, trees and shrubbery. He or she also modifies and replaces existing plants and materials in addition to establishing new beds, installing sod and seeding a lawn. Landscape architect: Generally a landscape architect works on large-scale custom tasks and creates site plans for drainage and landscaping. Landscape architects are able to produce construction documents and plans similar to blueprints, which may be relied upon in the construction of structures as well as excavation and grading work. Landscape designer: There is much overlap between work performed by a landscape architect and a landscape designer, but the main difference is that a landscape architect has a professional license, while one is not required by someone working as a landscape designer. 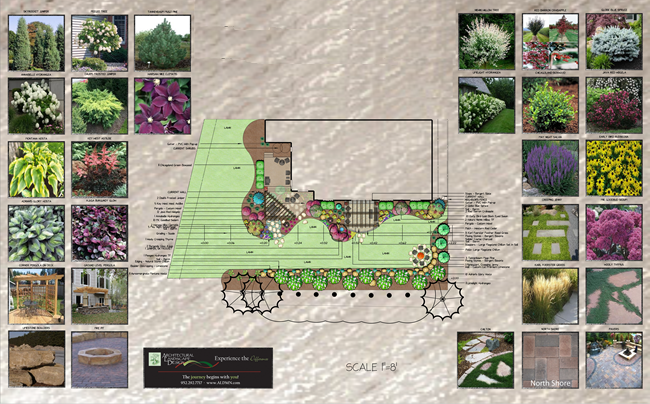 A landscape designer’s focus is more on the artistic rather than the technical. Certified arborist: An arborist prunes trees as well as diagnoses and treats disease and pest problems in trees. Horticulturist: A horticulturist plays a similar role to that of the arborist, except that the horticulturist works in the diagnosis and treatment of plants. It is important to remember that before hiring a company, you should check out their reputation and, if possible, get a trusted review from an online site or a recommendation from a friend or family member who has done business with them. Making sure the company has the necessary licenses, certifications, and insurance is also extremely important. At Architectural Landscape Design we are a one-stop landscaping resource. Not only are we a licensed MN landscape design and installation contractor, our founder Laura Westerude has a background and training in horticulture as well as landscape architecture and design. This means we are able to offer more services than many other landscape professionals. Click here for information regarding the variety of landscaping services available from our Minneapolis landscape company.